New exhibit now open at the Museum of the South Dakota State Historical Society at the Cultural Heritage Center. South Dakota Environments: A Window to Past Times, opened in the Observation Gallery on April 5. Four time periods are illustrated and discussed: the Paleozoic Era, the Mesozoic Era, the Pleistocene Epoch and the Holocene Epoch. Representations of a Tyrannosaurus Rex, a short-faced bear and a mammoth will be featured. 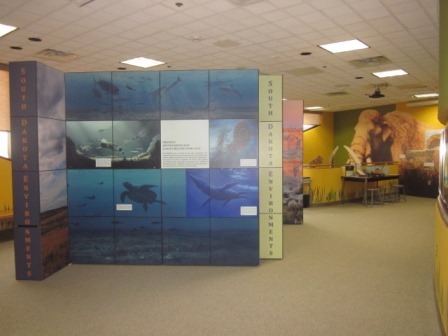 The exhibit shows how the state’s environment has changed over time. There are hands-on tables for anyone to play with from old or young!